Matching up the weight of donors and recipients boosts success in kidney transplants, suggests French research. A study of over 1,000 transplant patients found those receiving a small kidney in proportion to their weight were more at risk of complications. In the Journal of the American Society of Nephrology, the researchers said the findings would give surgeons a new chance to improve long-term survival. But a UK expert warned a donor shortage would limit weight-based matches. The team followed the transplant patients for an average of six years after their operation. Using a calculation based on the weight of the donor kidney, and the weight of the person having the transplant, they found that those receiving a small kidney for their size had more complications. These included high blood pressure, kidney scarring, and a 55% increased risk of transplant failure two years after the operation. Study leader Professor Jean Paul Soulillou, from the French National Institute of Health and Medical Research, said from a clinical point of view the impact of the finding was similar to when researchers identified markers to enable tissue type to be matched to reduce the risk of rejection. "This information is potentially useful for thousands of transplants and provides a new opportunity to improve long-term graft survival," he added. 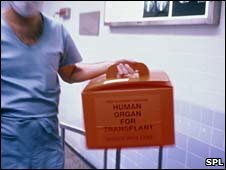 The vast majority of the transplants in the study were done with organs from dead donors. In the UK, living donor kidney transplants are on the rise - with 927 carried out in 2008-2009 representing more than one in three of all kidney transplants. Keith Rigg, consultant transplant surgeon in Nottingham and president of the British Transplantation Society, said doctors already consider body weight where possible in the case of transplants done with living donors. "The interesting thing they have done here is to actually weigh the kidney. "But the problem is when you have a scarce resource of kidneys, taking account of weight would complicate what is already a complex allocation system. "In the long term, it is still better to have a transplant than remain on dialysis."